سوری, روح‌الله, بیگلری, زهرا. (1395). مقایسه نامحدود وجودی با نامحدود کمّی. دوفصلنامه جاویدان خرد, 13(29), 59-84. روح‌الله سوری; زهرا بیگلری. "مقایسه نامحدود وجودی با نامحدود کمّی". دوفصلنامه جاویدان خرد, 13, 29, 1395, 59-84. سوری, روح‌الله, بیگلری, زهرا. (1395). 'مقایسه نامحدود وجودی با نامحدود کمّی', دوفصلنامه جاویدان خرد, 13(29), pp. 59-84. سوری, روح‌الله, بیگلری, زهرا. مقایسه نامحدود وجودی با نامحدود کمّی. 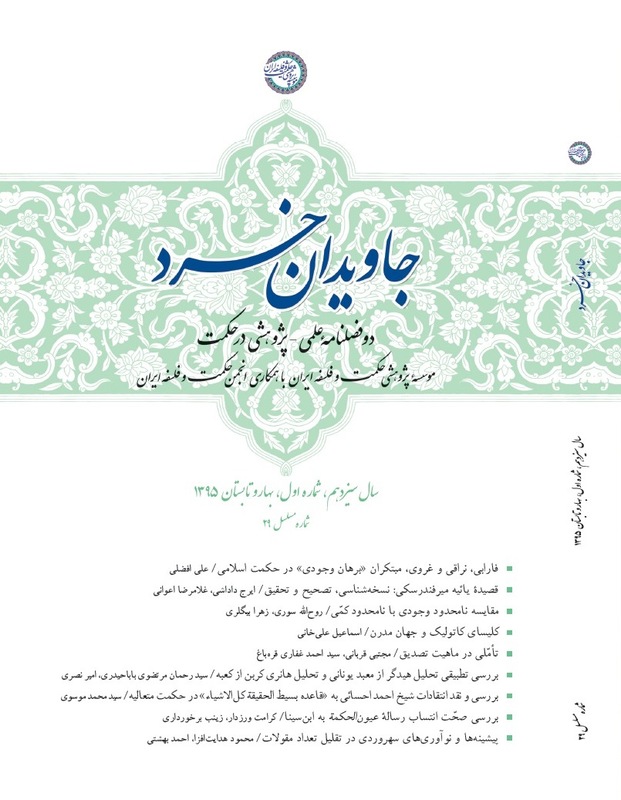 دوفصلنامه جاویدان خرد, 1395; 13(29): 59-84. نخستین آشنایی ذهن با نامحدود در قالب مقوله کمّ است. ذهن با سلب محدودیت از برخی انواع کم، کم‌های نامحدودی را فرض می‌کند. مشاء منکر تحقق خارجی نامحدود کمّی است؛ زیرا بر اساس دلایلی ابعاد نامتناهی را محال می‌دانند. اما اهل فن دلایل ایشان را ناتمام می‌داند. افزون بر اینکه تناهی ابعاد، لوازم باطلی دارد که دلیلِ بطلان این مدعاست. وجودهای پیرامون ما محدودند؛ یعنی گستره‌ وجودی آنها با حدودی پایان می‌پذیرد. سلب این محدودیت، تصوری اجمالی از وجود نامحدود به دست می‌دهد. کره‌ای با قطر بی‌نهایت همه حجم موجود را تصاحب نموده و بهره کره‌های دیگر تنها حدود و تعین‌هایی در متن کره بی‌نهایت است. چنانکه وجود نامحدود کل وجود را داراست و اشیاء دیگر تعینات و برش‌هایی در متن اویند. این مثال برای فهم نامحدود وجودی از نامحدود کمی بهره می‌جوید و نقاط قوت و ضعفی دارد که بی‌توجهی بدان‌ها موجب کج‌فهمی و بروز شبهات است. تصور نامحدود وجودی بدون نامحدود کمی نیز ممکن است. ذهن نامحدود تصورات نامحدودی دارد که مخلوقات این ذهن‌اند. در این مثال نامحدودی به معنای فردانیت و یگانگی در وجود است. بر اساس این دو مثال، وحدت شخصی بهترین تفسیر برای وجود نامحدود است و تفاسیر دیگر نقائصی دارد. The first acquaintance of the mind with the concept of the unlimited is in the form of quantity category. By means of negating limitation from some quantities, it understands unlimited quantities. The Peripatetic philosophers do not believe in the external existence of unlimited quantities, because based on some reasons, they consider unlimited quantity as an impossible one. However, many specialists believe that these proofs are not adequate. Furthermore the limitation of dimensions has an implausible consequence which is a reason for the falsity of this claim.The beings around us are limited, i.e. their existence end at a certain limit. The negation of these limits gives us a brief conception of the unlimited being. The circumference of an unlimited sphere occupies all of the existing volume. The rest of the spheres are simply the limitations and specifications within the unlimited sphere. In the same way, the unlimited being includes the whole existence. At the same time, the rest of the beings are simply the specifications and the limitations within it. This is an example to help facilitate the understanding of the unlimited existence using the unlimited dimension. Of course, it has some pros and cons which dearth of sufficient attention to these matters causes much misunderstanding and the appearance of many misgivings. The conception of the unlimited being is also possible without reference to the unlimited dimension. For example, the unlimited mind has an unlimited number of concepts that are the creatures of this mind. In this example, the 'unlimited' means unity in existence. Based upon these two examples, the unity of existence is one of the best interpretations of the unlimited being; while, the other interpretations have their drawbacks.